So it’s that time of the year again…this is pretty much a semi-annual event. My knitting mojo has gone missing and while I am still doing some knitting, I am not taking a lot of joy in it at the moment. 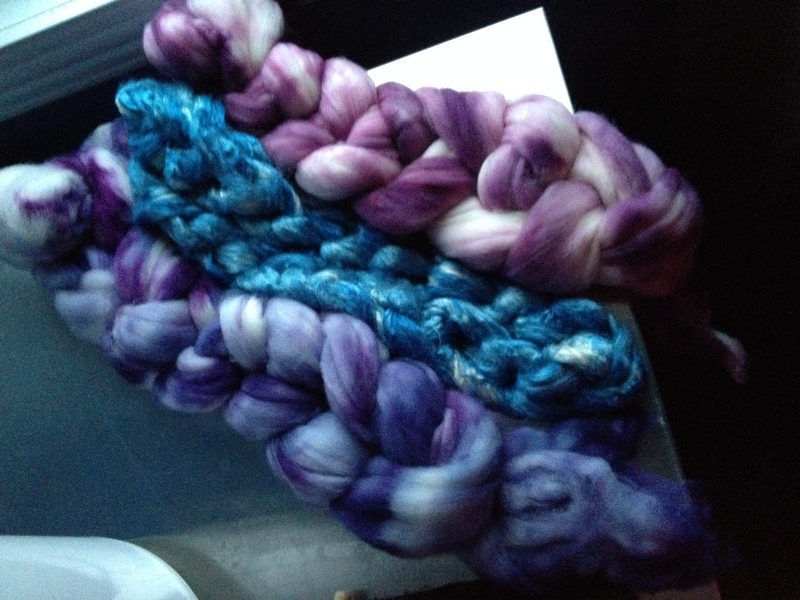 So on the weekend, I broke out the Crock-Pot and the dyes, and I dyed up some Superwash Wook roving and some Tussah silk in purples and blues. I think I know just what I am going to do with them but a bit more on that later. And last night, my Lendrum finally made a re-appearance in my life. Since it had been three months, it took a little bit of finagling (amazing the little detail you forget when it’s been that long) but by the time the evening was done I had very little of the batt I was playing with left. I had started this batt as an attempt at “long-draw drafting for woolen spun” yarn, but it really did not work out. My spinning-teacher-turned-friend, Leslie, surmised that it was the fibre prep, and that I should try that technique with another batt somewhere down the road. I purchased Jacey Bogg’s Craftsy class on drafting, so it’s pretty much guaranteed that I will be trying it again. I have several beautiful Inglenook Fibers batts…the handiwork of the ultra-talented Mother Macrina, but they are all so stunning, I can’t bear the thoughts of “ruining” them with bad drafting. In addition to all of this, I have other fibre treats on order and I am hoping to have them by the weekend. So, I may not be knitting, but I am not letting that keep my fibre-y creativity down. That being said…if you find my knitting mojo, please do send it home. I miss it. You can’t learn to draft for long draw if you don’t have the right prep for fiber, you figured that out. If the really nice fiber is the right prep for long draw you won’t ruin it. Just try a little bit. BTW, I can’t do long draw because I always buy the wrong fiber. Just sayin’. Yeah, Leslie was pretty clear on that. The batt I was using was more “muddled” I think than it was supposed to be. Leslie recommended rolags and had planned to bring me some…but we never got a chance to experiment with that before I left Toronto. 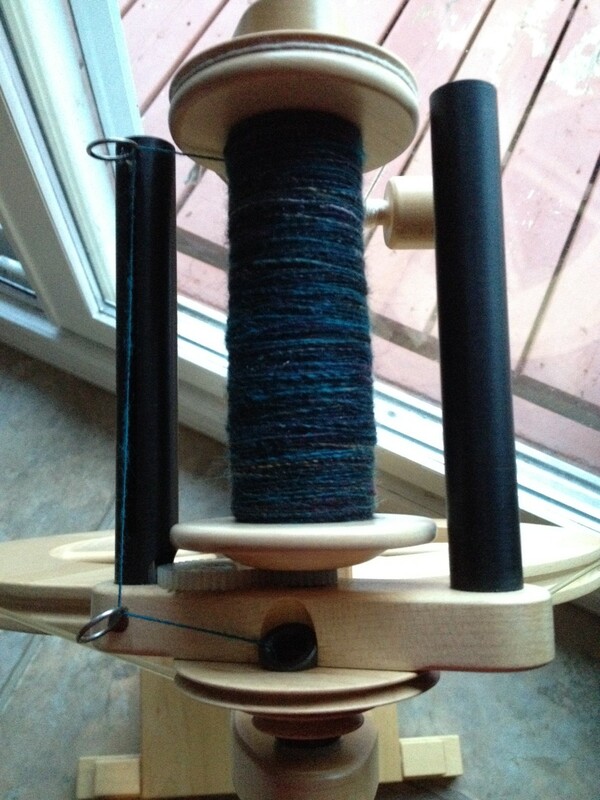 Sometimes spinning yarn seems like my knitting mojo chariot! The other treats and long-draw promises may be just what the mojo needs… love the dyed braids! The braids weren’t exactly what I had planned but I am not at all unhappy with how they turned out 🙂 I am not creative, colour-wise, so I am always a little scared with how dyeing will turn out! I also need a larger hot plate and a large rectangular chafing-dish-style plan to dye with. LOL – mine hasn’t gone anywhere and I am working more than when I was in Toronto! But it’s good to have a job that’s busy…it bodes well for future employment. I think your knitting mojo and mine are off on a sunny, southern vacation together. If your’s shows up, please send mine over here.